This is the Flour Loft studio where Alice and I design and handmake textiles from our large collection of recycled fabrics. It is in an old bakery building in a pretty market town in Hampshire where we grew up. Alice and I have been friends for a very long time now, since the age of 11, many many moons ago. We went to secondary school together during which time we took an evening class in batik and indigo dying in this very room. 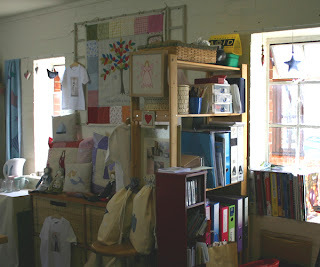 So when the studio became available it was fate, like a full circle as here was where our love of textiles began. The room, like us, looks a little different now .. the large dye vats have been replaced with crates full of fabrics and one end of the room has been closed off completely to create a small kitchinette area. Our business started over 5 years ago , very much from the kitchen table and very much around our 4 children. We are still primarily mothers and proud to be so, but as the children started school we were able to put in more and more time and although lovely to work from home, we soon realised that we needed a shared space. We moved into the Flour Loft 3 and a half years ago and feel fortunate to be there. The building is situated just behind the Market square, so we are right in the centre of town. To get to The Flour Loft , which is on the first floor, you must climb a decorative spiral staircase. Very pretty but not practical for moving furniture and stock up and down for shows! Inside the studio we have 4 old crickle windows, 2 on each side so we get plenty of sunshine streaming through. We have one large cutting table which came from a local fabric store which had closed down and 4 sewing machines. 2 lovely old Berninas ( both family heirlooms), a more modern Pfaff ( from my costume making days) and a reconditioned industrial which at this late hour i can't remember what it is.. another Bernina i think. Anyway we are well equipped. We also have created a little office area and the best thing we bought besides an essentail computer was a 4 in one printer, scanner, photocopier and fax machine. We tend to mess around with scaling up and down different designs and this is invaluable. Even more essential we have a little area to make tea and keep biscuits. The kettle is always the first thing to go on each morning! This is a late post , so I'm off to relax now. Ohh let me loose in that loft with all that fabric! thanks for the lovely comments and good luck with the hand washing! What a wonderful name. I just started blogging yesterday and am very much new to the whole thing. I love your little flower brooches - they are sooo pretty. I wish you well with your blog and I have added you to my favourite blogs so that I can check back often. I just discovered your blog via Ragged Roses. 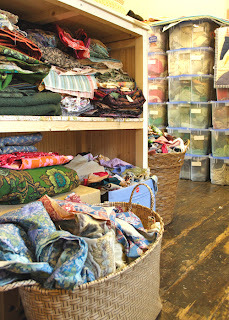 What a lovely workspace you have and such pretty fabrics. I love your workshop. Everything you need in one big gorgeous space! Tea and biscuits? essential to any work room I would say. I can't wait to get my (tiny) work room at home finished. Any tips on getting it right? Oooohh you took me be surprise there, I'm on the borders of hampshire, into textiles in a major way and am also called Ginny. What a coincidence, there's not many of us Virginia's in this part of the world, well I don't come across them anyway. Now have to go back and read all about you. Lovely post, great to read all about how you two got started up and where you work. Looks like a really fab work space you have there. It must great working in a team, bouncing ideas of each other! Will add you to my side bar. Hi Ginny - I am very envious of your set up - how wonderful to have all that space - at the moment (when I am sewing) I am on the dining room table that needs to be clear for evening meals and breakfast! I think women's businesses are often a success because of children. Having children is a natural break in a career - it makes you think about how much time you want to spend away from them and how good a job has to be to take you away from them. I have many friends who have completely changed their lives since having children (me included). Then, if you start a business, fitting it in during naps and evenings, it has to grow slowly, allowing you to make mistakes in a small way and giving masses of time to dream and develop. And then they start school! 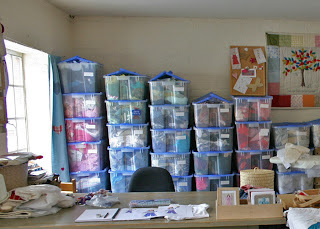 WOW you almost rival my Mom's stash that takes up a sewing room and a garage!! Incredible workspace. i wish my townhosue were big enough for one for myself and my quilts. You ar eso fortunate! !